Mealtime can present a wide array of problems in behavior from your child, but luckily there is plenty you can do to stop it if you have a plan in place. On Becoming Babywise Book Two dedicates an entire chapter to coaching you through this process(starting on page 65). I will encourage you as they do: consistency is key. Some common problems that come with mealtime are: flipping plate, throwing food, screaming, blowing raspberries, standing, arching back, banging tray, and intentionally making messes (in hair, on plate, on floor, etc.). Here is what I do. My methods do vary from the methods outlined in On Becoming Babywise Book Two. Both are effective. The “how” is different, but “why” is the same. I start with a gentle “That’s a no.” I usually follow that up with “we don’t XYZ.” For some, this will be enough. Most, if not all, will at some point continue the behavior out of curiosity over what you will do when she does so. You will continue on to step two, calmly. This is a light consequence moment. Babywise suggests you remove baby to her bed, but my baby’s bed is far from the kitchen. Having to go to the bed would make disciplining at this point enough of a pain I might avoid it. So, I leave baby in the highchair, but remove any food (our highchair has a top tray, so I just remove that tray and baby still has a tray). I then tell baby, “uh-oh. Looks like you don’t want to obey. Let’s take a break.” For a younger baby, around 6 months, I would sit there and just pause from feeding for a minute. As the baby gets older and more aware of what she is doing, I turn the baby so she can’t see me (though she can see outside and that is fine). After a minute or two, we try again. If the child does the offense again, I may or may not start with step one and retry. I also might go to step three. This is when I assume baby is done eating and we end mealtime. This is if it is safe to assume baby is acting out because baby doesn’t want more food. I don’t end it if baby is still hungry. One note, if baby is doing it to get out of the highchair, you don’t want to reward the behavior. For example, Kaitlyn would sometimes push all of her food onto the floor when she was done. I definitely did not then remove her from her high chair immediately. I taught her the right way and she waited for a minute or two before she got out. 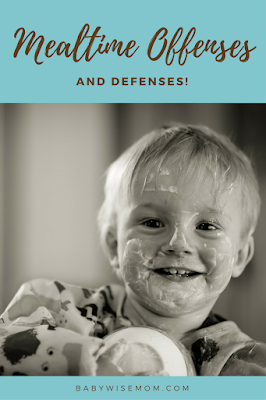 There are plenty of chances to teach your baby to obey you without having to turn mealtime into a battle ground. 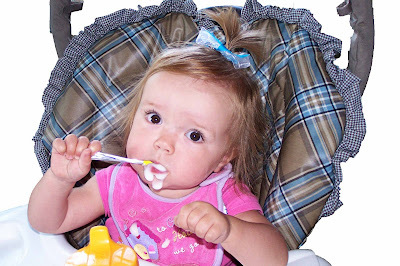 If your child insists on standing in the highchair, strap her in. It keeps her safe and keeps mealtime about the meal. If your child plays with her plate, don’t give her a plate (this is for babies). I don’t ever give my children under age one a plate. I don’t usually give them a plate until they are out of the highchair and sitting at the table. If your baby likes to blow raspberries, practice that in the tub. The tub is a great place for raspberries. This is practicing substitution. Raspberries are a normal things for a baby to do, but that doesn’t mean that baby needs to do them while eating food. You don’t need to wear it and you don’t need to wear a space suit to stay clean. Baby can do raspberries elsewhere and still get satisfaction from it. I also don’t have a problem with my baby holding a toy in her hand while she eats. Our highchair came with some toys, so my babies have all held a spoon or little pan while eating. You could use a baby spoon. I don’t let them put the toy in their mouth while eating (easier said than done with some). It keeps baby content to just eat, and it has never caused problems in our future. You can also offer consequences. If your child insists on making a mess of the food, give her one piece at a time until she can handle having a few pieces. That actually leads to a good point that you don’t want to put too much food in front of your child anyway. If she slams her tray and won’t stop, buckle her in and remove the tray. If she arches her back, patiently wait for her to be done before you make your next move. She is likely doing it out of frustration over something. Remember to teach sign language (she might be screaming because she is either done or wants more). Also, work with her to obey at other points in the day. The mealtime issues can be easily addressed. Make a plan, prevent where you can, and eat in peace! Do you have anything unique you do in your home? Please share! Oh, thank you so much for the tips. My son has been very frustrating with meal times and it has definitely become a "battle ground." These are some very good ideas I can't wait to try. I appreciate this post as we are getting into some mealtime issues. One additional comment, my son will scream when he wants more food, or his water, etc. and I may be near him or closeby. I'm teaching him to say, 'Mama' for my attention rather than scream. I'm also working on the sign for 'help' or the actual name of the food/drink instead of 'more.' It's more functional for a child to learn the names of things in my opinion. Thanks! My 18 month old STILL has bad mealtime manners and from the beginning I have tried to follow the BW principles, so it can be frustrating. She also knows sign language. But I'm hopeful, even more so after reading this post! Thanks! I noticed with my oldest son that he was more likely to blow raspberries if the food was warm. He was mimicking me blowing on it before feeding him. Here's a mealtime queston… My daughter is only 6 months old but has been eating solids for the past month. She loves to grab the spoon and direct it to her mouth and then lets go as soon as the food is in her mouth. She isn't rough with it and it's not like she's snatching it away from me. It's like she wants to "help". Should I encourage or discourage this behavior? If there's nothing wrong with it, I don't want to make her stop and then down the road have to teach her how to use a spoon. But, if there's a good reason to teach her to let ME feed her, I'd like to know. Thanks! You are all welcome! And interesting observation Jamie! Kelley, so long as she maintains the "good manners" so to speak of helping with the spoon, I personally don't see it as a problem. I am sure, however, that some BW people would disagree and say it is a problem. The potential problem is her becoming "wise in her own eyes." Having control over this, she might not want to have a lack of control in other areas. So watch for that. If she shows resistance to your authority, I would consider cutting this, but so long as she is okay with your authority, I think it is fine. 12 month old (9 months adjusted) keeps mouth closed, cries, whines, fusses, bark fits at us after eating the first couple bites. Also pushes hand away if mouth is full. I do not know how to handle it. I know hes hungry bc he has only had two bites so ending the meal seems to exacerbate the immediate problem, but maybe that will help him to open his mouth next time?